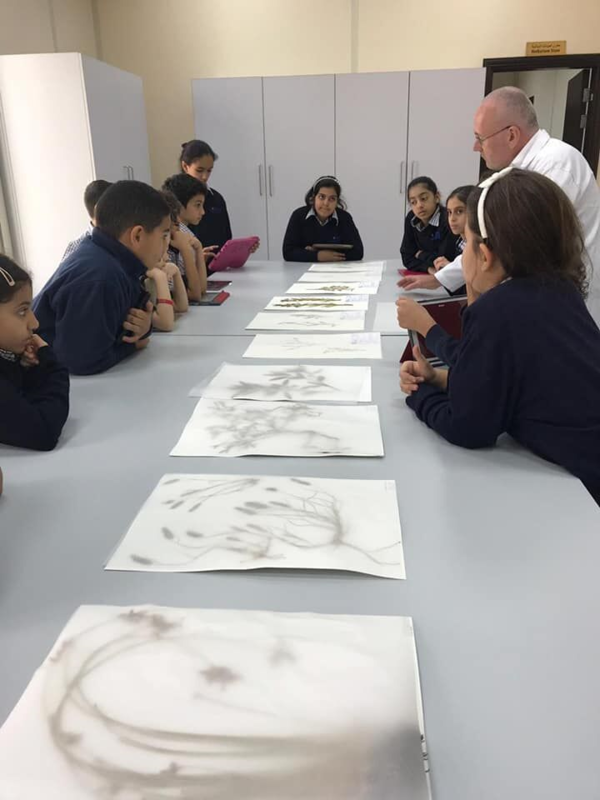 85% of children attending an organised open day at the Sharjah Seed Bank and Herbarium said their experience had: “increased their interest in science”. Just one of the conclusions that resulted from a successful Schools’ Project that opened the doors of the seed bank facility in the town of Al Dhaid, United Arab Emirates. The Sharjah Seed Bank & Herbarium (SSBH), is an initiative of the Ruler of Sharjah, His Highness Sheikh Sultan bin Mohammed Al Qasimi. It’s role to focus on research and ex situ conservation of native plant species of Sharjah and the other Emirates. The inaugural School’s Project event hosted 120, Grade 5 pupils from the Victoria International School of Sharjah, which like SSBH, was founded by the generosity and commitment to education of His Highness Sheikh Sultan bin Mohammed Al Qasimi. During a fun and fact-filled day, pupils explored four different workshops giving them opportunity to investigate plants and understand the role of the seed bank in a real-life work environment. Each child received a tour of the facility and viewed state-of-the-art technology to learn how and why seeds are carefully prepared and stored in freezers at temperatures as cold as the Arctic. These techniques allow seeds to remain dormant for tens, hundreds and (maybe) even thousands of years, until needed. This is a vital conservation action to help safeguarding the UAE’s flora. In the facility’s Biotechnology Laboratory, scientists introduced plant DNA and explained how it can be extracted from cells. Pupils took part in separating DNA from strawberry fruits, then watched scientists demonstrate extreme freeze-drying of plant material at (minus) -180°C, a technique widely used at the seed bank. Other workshops focused on seed dispersal, including the various tricks that enable fruits and seeds to move from one location to another and the chance to examine different plant parts and look at them in new ways under the guidance of experienced field botanists. “We all depend on plants, they clothe us, feeds us and in many parts of the world provide shelter. Despite this, plants are often taken for granted and dissolve into the background of everyday life. Children hold the future of tomorrow’s wildlife in their hands, and in order to appreciate you need to first understand. This philosophy spearheaded the Schools’ Project, that aims to bolster the studies of the young in the real-life situation of a working plant science laboratory.”, said: Dr Dave Aplin, Senior Executive of Sharjah Botanic Garden. After the visit, Seed Bank staff felt it important to evaluate the event and hear what the children actually thought about the event in order to improve the education experience. They were asked to complete an anonymous online survey. The results revealed 94% loved the experience, 85% told us it had “… increased their interest in science”, with the biotechnology lab experience being their overall favorite activity. “The whole process of finding good seeds”; “The biggest seed is as large as a bucket”; “I never knew there was such thing as a DNA”; “I didn’t know that the plant’s DNA was inside the it’s the cells”; “The tour was my personal favorite. It was very informative and fascinating especially for someone like me who is interested in knowing what happens in places like this”.